Great Steak, no BULL! Great food shared with friends and family, a place to be social. It’s a restaurant! It’s a lodge! No, it’s a…. well, our SteakhouseCasual restaurant and our irreverent urbanLODGE are both under the same roof. Experience one. Or the other. Or both. The term steakhouse usually brings associations of a high end, expensive eatery. That’s not what you’ll experience when you walk into a MR MIKES SteakhouseCasual location. Prepare yourself for something a little different. Okay, a lot different. Mr Mikes SteakhouseCasual is about feeling like you belong, where everyone feels comfortable in his or her own way. It’s humble and modest and it’s your place - a place where you don’t have to be something you’re not, you can just be yourself. It means tasty and affordable creations from our signature steak and Mikeburgers to our home-branded wines and beers. It's about creating memories, uncontrollable laughs and the charm of warm service. Founded in 1960, the very first MR MIKES was the ultimate definition of ‘casual’. A cafeteria-style grill where you served yourself a salad while waiting to pick up your steak. An affordable way to enjoy high quality beef, it was also highly successful, growing into a chain of unique, no-frills steakhouses known for good quality, sensibly priced food. That concept has evolved over the last half century, but still embodies all the things our customers have come to love - high quality, value & friendly surroundings. No pretentions. No airs. No attitudes. Many restaurants have lounges. Even more have sports bars. Nobody has an urbanLODGE. “The Lodge” is unique and refreshingly relaxed, with an upbeat urban flare. Relaxed and welcoming. Immediately comfortable. An ideal place to unwind with friends and enjoy a generous selection of tasty and creative drinks. And well worth it. The urbanLODGE is an undeniably Canadian experience. 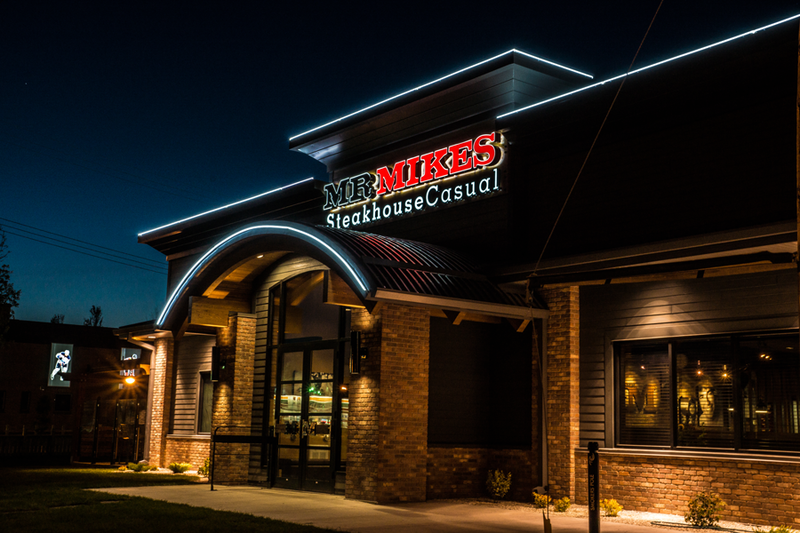 Join Mr.Mike's Today If you love delicious meals, good company, and the smell of success, this is a great time to RAMMP up your future and open Mr. Mikes SteakhouseCasual franchise. MR MIKES has seen great success in Western Canada and is continuing its expansion now into Ontario.